LAUREL HIGHLANDS, Pa. (Oct. 2, 2017) – Fall has arrived in Pennsylvania’s Laurel Highlands and there are more craft beers brewing than a coven of witches&apos; cauldrons. 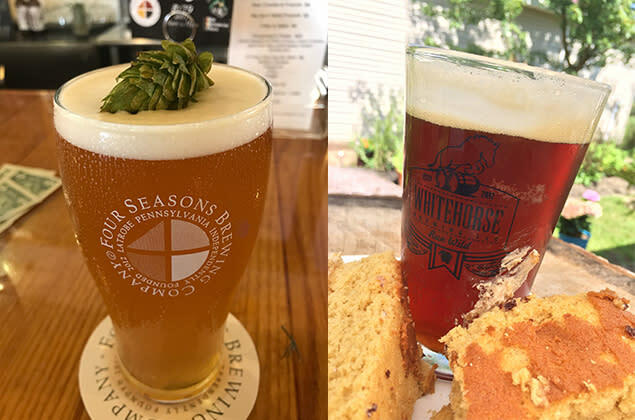 From Octoberfests to dark lagers to pumpkin beers, here are all of the new fall brews to look forward to at microbreweries and craft breweries located throughout the Laurel Highlands. A new partnership between Yellow Bridge Brewing and Greensburg&apos;s Tapped Brick Oven & Pourhouse has beer fans saying "cheers!" and giving back to the community. Their Foster Pumpkin Project ale was carefully crafted by their brewers to present a refreshing pumpkin ale with a 7% ABV, utilizing traditional pumpkin pie spices such as fresh ginger root, whole cinnamon and freshly harvested whole hops. This brew is only available at Tapped and the Yellow Bridge taproom. More importantly, one dollar from every pint of Foster Pumpkin Project sold will be donated to the Foster Love Project, which seeks to provide love in action to foster children as well as support to the foster families who are providing care for them. Whitehorse Brewing released their Beerlin Octoberfest, a seasonal lager that takes the traditional maltiness of the style (Vienna, Munich and aromatic malts provide the malty backbone) and hops it up (Mosaic and Liberty hops shine brightly with each sip). Also, look for their Olde Bakery Ale, an amber to dark amber ale with a sturdy malt backbone and a clash of American nugget hops, English fuggle hops. Plus, this ale has a unique twist: Whitehorse makes their own burnt sugar and adds it to the finished beer to sweeten the deal. This one-of-a-kind ale pays homage to Somerset County&apos;s Pennsylvania Dutch heritage in a truly delicious way! Bloom Brew is celebrating fall with three new beers. If you love pumpkin beers, you have to try All Hallows Ale, made with sugar pie pumpkins processed by hand then oven-roasted. With six different spices, this is the real deal for pumpkin beers. Then, grab a pint of Autumn’s Colours, their Octoberfest beer made with German malts and lagered for six weeks, or Roggen Z Noggin, a rye beer brewed with malt from Whiskey Boy’s Distilling Grains in Bentleyville and enhanced with a touch of caraway seed. If you&apos;re looking to try a large variety of quality craft beers, look no further than Four Seasons Brewing Company. This fall, they&apos;re making a Pumpkin Ale, Oktoberfest, Dunkle-Weizen, Harvest Ale, Coffee Porter and Brown Ale. Also, don&apos;t miss these great events happening at Four Seasons this fall: Oct. 21 - Russian Imperial Stout Bottle Release, Oct. 28 - Annual Halloween Party. For more information about local beers and breweries, please visit http://www.laurelhighlands.org/things-to-do/breweries/. A magnificent mountainous region, the Laurel Highlands spans 3,000 square miles in southwestern Pennsylvania. Located just east of Pittsburgh, the beautiful four-season destination offers some of the most spectacular natural scenery, outstanding outdoor recreation, historic sites and attractions, classic family activities and world-class resorts. Notable destinations within the region include three architectural masterpieces by Frank Lloyd Wright – Fallingwater, Kentuck Knob and Duncan House – Seven Springs Mountain Resort, Nemacolin Woodlands Resort, Flight 93 National Memorial, Idlewild and Soak Zone, whitewater rafting at Ohiopyle State Park and more.